This group of flowers comprise my list of all-time favorite winter season wedding flowers. The red or white flowers fit very well with the traditional red, green and white Christmas themed wedding, and the pure white flowers work better for winter focused themes. Pair any of these flowers with pine boughs, holly or cypress to complete your winter inspired wedding table centerpieces. Try other unique ideas that don't include flowers if you're looking for something a bit different. Miniature Christmas trees or topiaries in festive pots come to mind, or maybe you'd like to display wintery pinecones beneath frosted glass domes. If you are going to spring for pin-lighting for your wedding tables, choose frosted or glittery elements that will catch the light. 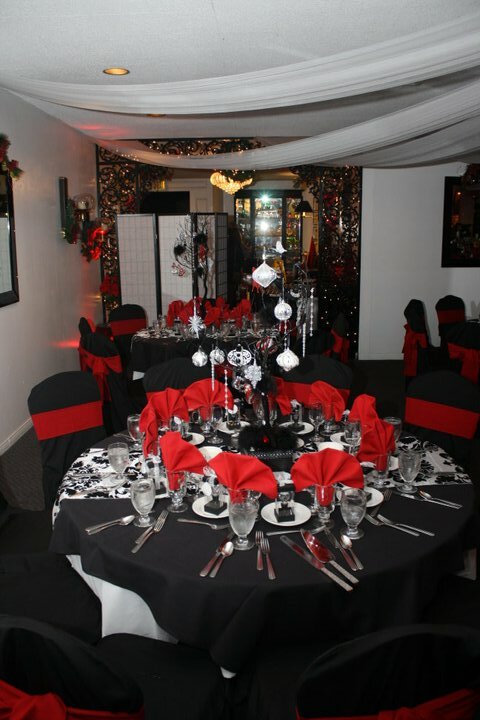 A good lighting technician will know just how to highlight your centerpieces perfectly. Okay people it's Spring, so there are a TON of wonderful flowers to choose from. I will try to list a few of my favorites, and give you some ideas for creating a Spring theme. I'll leave roses out of this list since they are an obvious choice for just about any season, and there are so many other wonderful flowers only available this time of year. Having to slog through months of snow, sleet and rain make you appreciate the bright colors of Spring so much more. I live in California, so I must admit I have it pretty good, mild winters mean color can be found, even if a bit less frequently. I still however feel excitement when Spring flowers appear in the downtown flower market and lovely ideas for centerpieces are everywhere. As an ode to the season I like to use these flowers in arrangements that mimic how they grow in nature. Boxed centerpieces with natural grass as filler is a favorite arrangement of mine for spring. Daffodils and Tulips also work especially well as single stem flowers and can be placed in decorative mini vases and grouped together. Summer wedding flowers can be comprised of just about any type of bloom. Here is your chance to use gorgeous flowers at their peak. The hard part will be choosing which ones to use! I have the most fun choosing flowers during this time of year, the selection is great and prices are better since supply is through the roof compared to other seasons. This is the time of year for big, opulent wedding table centerpieces, especially if you are a flower lover like I am. For a unique twist try bright citrus as vase filler, and stark white flowers to contrast these vibrant hues. The look is clean, elegant and classic summer. Fall flowers are not as simple, but no less beautiful to admire, choose and arrange for your wedding centerpieces. Besides, if all else fails you can use the classic staple Roses that come in several magnificent fall shades. All of these flowers come in great shades of orange, red and deep yellow, all of which are perfectly suited for autumn theme weddings. As with your Christmas and winter theme wedding table centerpieces, you can add other natural elements, reminiscent of fall like acorns, pinecones or colorful fall leaves.